Progressives aren’t exclusive to pokies – you can win a huge jackpot playing blackjack too. Playtech offer the chance to play traditional 21 with the added bonus of being able to win a huge progressive prize pool. Progressive jackpots on blackjack games work in a similar fashion to pokies progressives. Whenever a player places a real money wager on the game a percentage of the bet is added to the prize pool. This causes the jackpot to grow and depending on how many people play it can get quite large. A player can then win the progressive by making a side bet while playing a hand of real money 21. The best variant offering a progressive jackpot is Playtech’s 5 Hand Blackjack Progressive title. 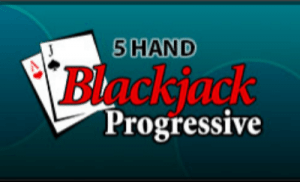 What is a Blackjack 5 progressive? With Playtech’s progressive variant, players can opt for up to five simultaneous blackjack hands at once, each with the opportunity to make an additional bet in order to try and win the progressive jackpot. This is playable for real money or free play/practice mode at Casino.com. 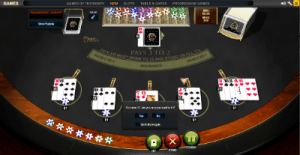 Playtech’s 5 Hand Progressive Blackjack is unique to Casino.com. Six decks are in play with standard European blackjack rules, where the dealer has to draw on 16 and Stand on all 17s. Splitting is acceptable on the first two cards, with as many cards as you want eligible to be drawn unless you’ve Split Aces – then you can only draw once. Double Down is available, as is Insurance and a unique rule called 10 Card Charlie where you win if you draw 10 cards without going bust. Chip sizes available on Playtech’s variant range from 0.01 to 25, with a minimum table limit of $0.50 and maximum of $50 at Casino.com. Once logged in, there is an option to choose from minimums of $5 to maximums of $500 for this title, however. Place your bets by dragging the chips to the table, and place them on each hand of up to five hands available. Then click Deal. The house edge for this variant sits at a low 0.42%, with an even lower house edge attached for the side bet, which we go into below. As you can see, gameplay is incredibly straightforward – it follows traditional blackjack rules – but there’s also a side bet available in real money mode which gives you the chance to win the progressive jackpot attached. A coin slit icon sits next to each betting option for the blackjack hand. In real money mode, this will be clickable, and doing so places the side bet of $1. The light will turn green and 3% of your bet will be added to the progressive jackpot. You can make up to five side bets in one round – provided you place a bet on all five blackjack positions. To win the jackpot, you need to land four suited Aces. If you don’t, you can still win a payout with the side bet. Any wins from the side bet are paid at the end of the game, including the jackpot prize pool, and if you’ve opted to Split then they are calculated for each hand. The house edge for this side bet is set at 0.15% – incredibly low for a side bet in a game of 21. There is always money available to win with the jackpot progressive – even after a win a seed amount will be added by the casino to replenish the jackpot in case there is a back to back win. Playtech have the unique feature of making gameplay customisable. This includes changing the colour of the table. While it doesn’t sound much, changing it from the standard green to purple or white does give the overall experience a new vibe. There’s 10 available colours to switch between with gameplay remaining the same – five positions are available to bet on with this variant with five available side bet options. Basic strategy is important to keep the house edge as low as possible and when opting for the chart on this title you need to rely on the rules. The strategy provides you with the best possible move, statistically speaking, to make when considering the total value of your hand with the dealer’s up card. It won’t guarantee you a win every time, but it does improve your odds. The basic strategy relies on the number of decks and whether or not the dealer hits on 17. Fortunately, the jackpot side bet doesn’t alter basic strategy so you don’t need to hunt down a chart associated with these rules. You do need to ensure the chart is for a six deck blackjack game where the dealer draws on 16 but stands on all 17s however. This can be easily found doing a simple Google search – you can then leave the chart open in a separate tab while you play Playtech’s 5 Hand Blackjack Progressive. Find Blackjack Progressive 5 at Casino.com via your browser or by downloading the casino client.